1 photograph : b&w; 20.5 x 35 cm. This photograph originally owned by George Morrison and donated by Keith Mallman. 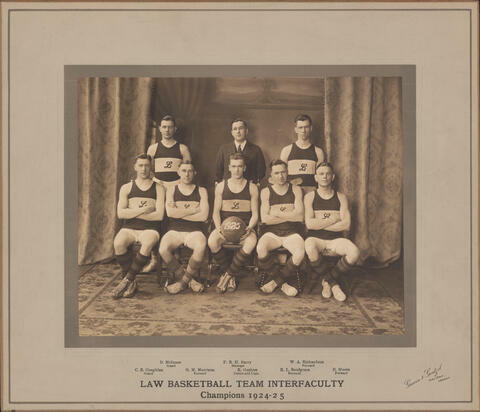 Item is a photograph of the Law Basketball Team Interfaculty Champions 1924-25. The photograph shows D. McInnes (Guard); P.R.H. Barry (Manager); W.A. Richardson (Forward); C.R. Coughlan (Guard); G.M. Morrison (Forward); R. Gushue (Captain, Centre); R.L. Snodgrass (Forward); and R. Moore (Forward) sitting or standing in two rows.